In 2008, I took a daytrip to Latakia on the Syrian coast to see what had been described to me as the Miami of Syria. A few years later, Latakia was one of the first cities to become a battlefield. I barely remember that trip; it comes in bits and pieces. I was lost in my head much of the day. I had come with aspirations of photojournalism, a picture essay comparing the U.S. and Syria, demonstrating our similarities. I wanted to have an answer to the constant question “why would you want to go there?” in the form of beautiful photos of a beautiful country and its people. I spent a long time at the waters edge, watching the sea where it disappears over the horizon and thinking of my predicament; my goals unfulfilled, my funds depleted, my inspiration waning. Now that term I was so fond of feels immature, naive. I had no idea what it meant to be lost among the empty waves. My problems were so trivial, not only when compared to the vastness, but compared to the trouble that was brewing, invisible to me. This beach that was so calm to me would soon become a symbol of desperate hope for the millions fleeing civil war. But I didn’t know that then. Quite the opposite, in fact. Syria seemed so stable, a relatively happy country. I was philosophically entranced with the idea that a second son, trained as an ophthalmologist, had become a moderate dictator due to the car crash that killed his brother. From eye doctor to dictator; the president who didn’t want the job. From an outside perspective at least, his government was trying to modernize the country. He was a dictator, yes, but I wanted to believe the image that he was a benevolent dictator trapped in the system his father had built. When the war started I was confused. I couldn’t understand how the doctor could become a the face of violent totalitarian government. I still can’t. I wish I remembered the city more. I remember the moment on the rock, and eating pistachios and pizza in a seaside cafe. I remember my left boot falling apart, walking sockfooted under the guise of what was left of my shoe after I ripped off the tattered sole. By the end of the day my pants had magically developed a revealing tear as well. I returned to the bus stop limping slightly with my jacket tied around my waist. And of course, I remember the bus ride. I have never been so scared for my life as I was for the three hours it took to drive back to Aleppo. The bus was at least 50 years old. The windshield defrost didn’t work. For the first ten minutes or so the driver alternated between holding his phone, his coffee or his cigarette, often two of them at a time while occasionally wiping down the window with a paper towel. We picked up an assistant for the driver just out of town who took over window duty. That way the driver could focus on his phone, smokes, and coffee while driving through the a rainstorm over a winding mountain pass lacking guardrails. My traveling companion and I shared a single pair of headphones trying to distract ourselves from the fear. 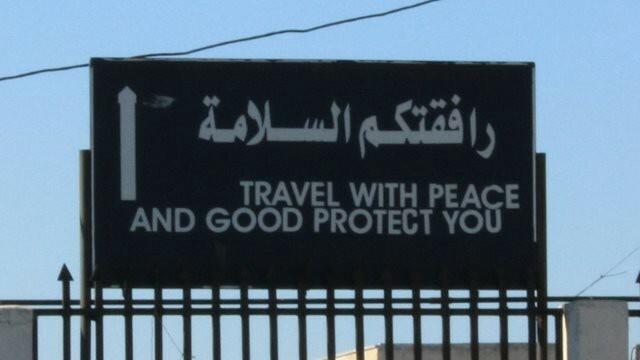 There was a sign outside of Latakia, mistranslated from Arabic to English. “Travel with peace and may good protect you.” I don’t remember why this came to mind recently, but it hung around until it struck me that the beach I am so fond of in my memories may be the same stretch of land where refugees are piling into undersized boats. And I thought of the volunteers waiting on the beaches in Greece with blankets, baby carriers, and whatever meager help they can offer to those lucky souls who make it back to dry land. May good protect you. I’ve told this story to friends before. It’s my everything goes wrong mini adventure story that ends with a laugh when we realized we could have taken the state of the art train back instead for only a couple dollars more. I always smiled at my thoughts of my one day in Latakia. But my story seems less funny these days. The ‘comfort of insignificance’ evaporates when I imagine the refugees standing at that port, contemplating crossing the water and disappearing over the horizon into an unknown future. That shoe that fell apart could have been easily replaced it in one of the street markets I walked through. The people taking the bus with me were doing so because it was the cheapest option, where I was simply unaware there was another. I was feeling stress at my unknown future though I knew I had a home to return to and I was fairly sure I would have work when I arrived. The sea that offered me comfort now offers a terrible choice for too many people, a dangerous journey with an unknown destination. For those that can afford to offer more, please consider donating or finding other ways to help.